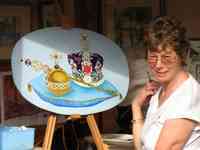 Painting pub sign for The Coronation Arms. My name is Marion Browning. I have always had a deep interest in all aspects of the art world. I acquired a place at Carmarthen College of Art as a mature student on a 2 year B.Tech course in order to gain knowledge and develop my abilities. The first foundation year included wild life illustration, art history, ceramics and textiles. The second year I specialised in textile design. I found the whole experience totally absorbing and rewarding. With the desire to further my art education I applied and was accepted at Winchester Art School for a 3 year B.A Hons. course in textile design. The texture and pattern of constructed textiles always interested me and I feel this comes through in my painting. In my second year at Winchester I won the Hampshire Drawing Prize and spent that summer visiting and drawing in London, mainly in the British Museum and Kew Gardens. In my third and final year I entered and won the Courtelle Award for 1988. The designer that year was John Galliano, his brief �to construct a textile which reflects old antimacassars and frost on a winters day�. My fabric was constructed from Courtelle yarn, monofilament and Lycra (which was in it�s early experimental stage). John Galliano made my fabric up into a fashion collection which was displayed at Harrods. Since that time I have concentrated more on painting and using a variety of mediums. My subject matter is varied but I greatly enjoy cottage gardens and �jumbled� scenes that define a variety of shapes and overlays. I am inspired by the works of Bonnard, Vuillard, Matisse, John Piper, Raoul Dufy and Toulouse-Lautrec.